question asked: Jan 16 '15, 2:14 p.m.
last updated: Jan 19 '15, 12:22 a.m.
Rafael Rodriguez Montes (208●12●74●148) | asked Jan 16 '15, 2:14 p.m.
when I tried link the package from Requisite Pro to the TestPlan I'm getting error message: Value of the attribute "name" is 1001 bytes, which is greater than the allowed encoded length of 1000 bytes. Don Yang (7.0k●21●85●116) | answered Jan 19 '15, 12:22 a.m.
RQM allows only 1000 characters for requirement name(internal restriction). 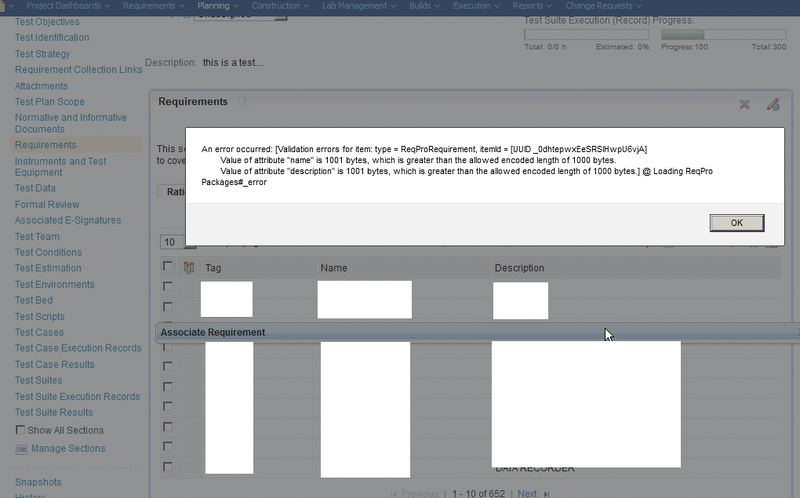 if you leave "name" field blank in ReqPro, RQM uses "Description" field as "Name".